Detroit loves its sports teams, and plenty of people show their pride by wearing team jerseys. However, this one was a first for me. I came across this jersey in someone's backyard and had to snap a photo. 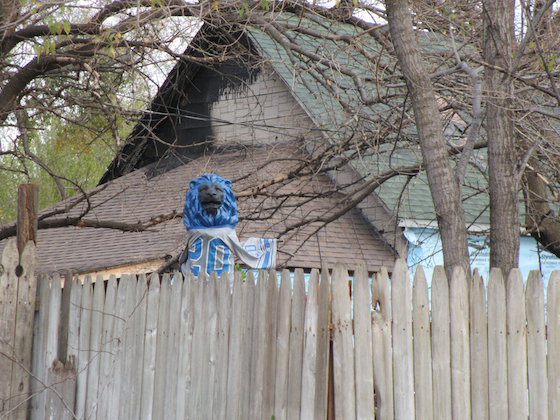 Best I can tell is it's a Detroit Lion scarecrow. The number 20 jersey has been worn by Lions' greats Lem Barney, Billy Sims and of course the incredible Barry Sanders. Without a doubt Barry Sanders was the most exciting running back I've ever seen play. His ability to take a 'ho hum' running play and turn it into one worthy of a highlight reel was amazing. I'll never forget attending a Monday Night Football game at the no longer used Pontiac Silverdome and being blown away by how fast Sanders was. We had seats far away from the field, and on one play he bounced off a couple of defensemen and bing he was gone. I can still see it. I've never seen another running back with his speed. At any rate, the number 20 jersey for this Lion fan has a new use. Go Lions! - Stay away birds.